You have the option of picking the color of parchment paper we use to print your certificates on. Your choices are Gold, Ivory or Blue. If you do not pick a paper color we use the default color of Gold. 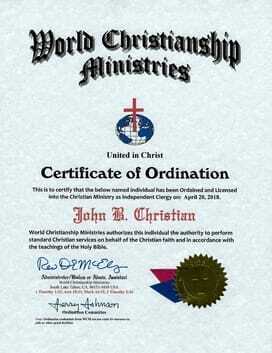 The ordination certificate is your main authority to do all Christian services and begin your church or ministry. If you need to file a copy of your ordination with any marriage license office before doing weddings in your state, this is the one you would use. 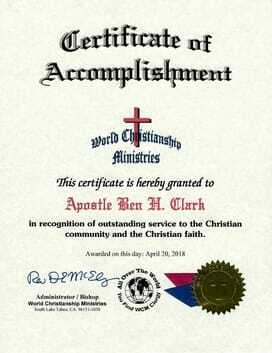 This certificate grants you the title that you feel is closest to the type of Christian work you will be doing. To get an idea of what the various titles mean, click here to detour to the Title's Page where the various titles are explained. 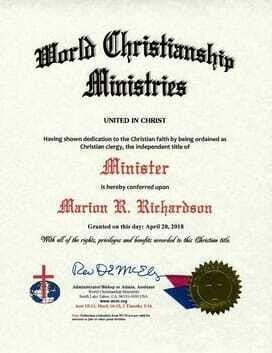 Title's can be changed at any time without affecting your ordination. 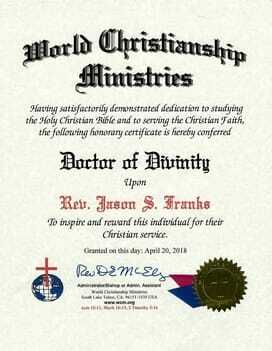 This is an inspirational certificate meant to honor you for your Christian work, past and present, and desire to help spread the Christian Faith either through ordination or other Christian endeavors. 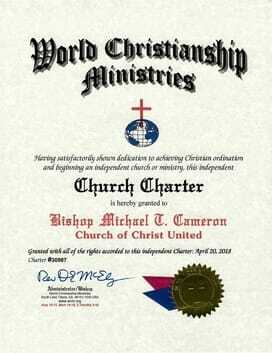 The Church Charter is our formal recognition of your new church or ministry's name. If you have our charter we give you authority to ordain into your own personal church or ministry in your church or ministry's name. 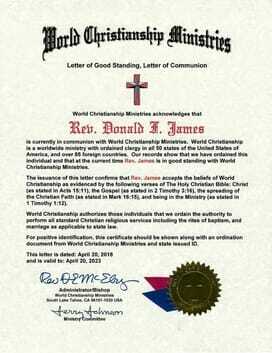 This is a certificate honoring outstanding service to the Christian Faith by receiving ordination and beginning a new Christian independent Church or Ministry. This certificate is meant to keep you in communion with WCM in case we are called to verify your ordination. You can find more information about this certificate by clicking here. 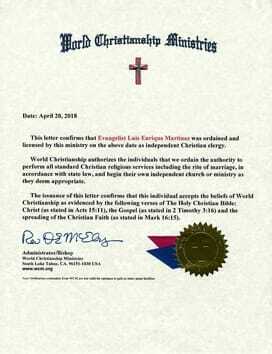 This certificate is also necessary for performing weddings in some states. The Letter of Good Standing is an optional Free Bonus item with any of our packages. The Pastoral Counselor certificate is granted after completing the New Testament Bible study course if you have taken the course that includes the Pastoral Counselor Certificate. 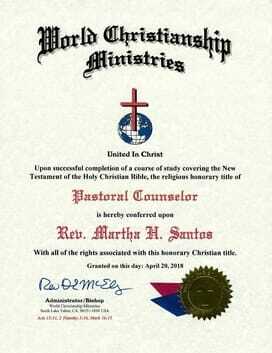 This certificate is meant to keep you within the pastoral limits of being a Pastoral counselor and is not meant to be a professional certificate. 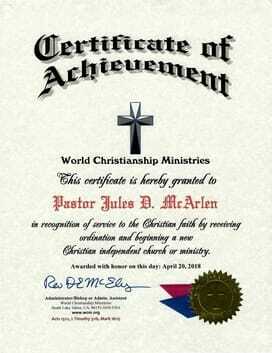 This is a certificate of inspiration and is an optional Free Bonus item with all of our Clergy / Minister Packages. 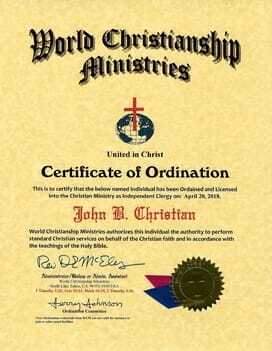 This is a counterpart to the Ordination Certificate in letter form. 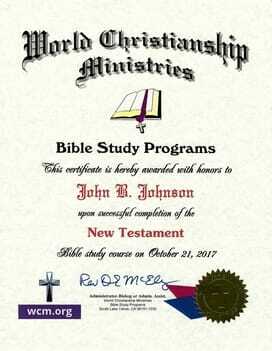 This certificate is a Free Bonus item with any of our Clergy / Minister Packages. You have the Option of picking the type of lettering you would like us to use on your certificates. Choose the lettering you would like on the Application-Ordering forms.